CertificationKits can supply you with all the equipment you need to build your very own Cisco CCIE home lab that has been updated for the new CCIE exam. Why spend $15,000(after course costs, airfare, hotel and other expenses) on a twelve day Cisco CCIE bootcamp that you will walk away with only a lab workbook and a stack of notes? Wouldn't it make more sense for you to own your own Cisco routers and Cisco switches in your home lab that you can practice with at your leisure for as long as you like with no interruptions? Sure you may be thinking, but I won't be have access to the CCIE lectures or other materials. Well, yes you will and CertificationKits has your Cisco lab solution for you and it will be cheaper than attending a CCIE bootcamp in person and you will own your equipment! How cool is that? We are going to change the way you approach your CCIE training while saving you thousands of your hard earned dollars! This is an especially great solution for companies who want to train their staff to obtain their Cisco CCIE certifications but can't afford to have their top network engineers off-site for two weeks at a time. Additionally, the cost savings of purchasing the kit one time which can be used for multiple employees is tremendous! Instead of looking at $60,000 to get four employees certified, what if you could tell your boss you could setup a lab with all the exact same lectures, lab work books, equipment and resources for about $3,000! That averages out to $750 per employee for CCIE training! Where can you get hands-on CCIE training for that cheap? June 14, 2014 CCIE Update! So it is finally here! The new INE CCIE v5 lab topology and there is quite a bit of debate on what is the best approach to this lab. There are two schools of thought on how to approach this CCIE lab setup and it really comes down to your personal preference as there are pros and cons of each. So if you are an aspiring CCIE you probably know by now that on June 14th, 2014 the CCIE hands on exam lab will be changing from a topics perspective and format. Now I am not going to cover all the topic changes in this blog post as that is an article for another time and you can find some of that information here CCIE v5 Exam Update Overview. In that article you will also note some of the changes in the three specific troubleshooting, diag and configuration sections. But for now we will cover what hardware you need to follow the INE CCIE v5 Lab Workbooks and associated training materials. So the big change from the last INE CCIE R&S topology is you go from about 14 devices to 25 devices. Given the increased number of devices there is some debate do you virtualize the environment or use physical Cisco routers and switches? So the first school of thought it that you can simply virtualize everything. Some possible solutions would be a Cloud Services Router CSR1000v which will support approximately 99% of the features you will need as long as you have the XE 3.11S (15.4S) IOS running the premium feature set. With this there are some basic drawbacks such as you will need to really bump up the RAM(minimum 4GB) and CPU(a minimum of 4 physical cores all in the same socket; no virtual) along with running it as a native install XenServer, KVM, ESXi or such baremetal Hypervisor as trying to run it on a platform such as VMWare Workstation is just not going to cut it. One nice thing is Cisco does provide a 60 evaluation license so you can play with this device, but you still have to invest a few grand into virtualization hardware and if you are not a virtualization guy, now you have to learn all the quirks of setting this up and keeping it humming and that can pull you away from your primary focus which is obtaining your CCIE! The next option you have is to use another virtualization platform such as GNS3 utilizing Cisco 7200 series routers running the Advanced Enterprise Services 15.2S feature set. The upside here is you do not have quite the virtualization investment you will have with the CSR1000v, but to spin up all these routers you are still going to need some serious resources that will still cost you quite a bit. Additionally, the stability of GNS3 is just not on par with the CSR1000v or that of real equipment and it has been reported to have its fair share of bugs. 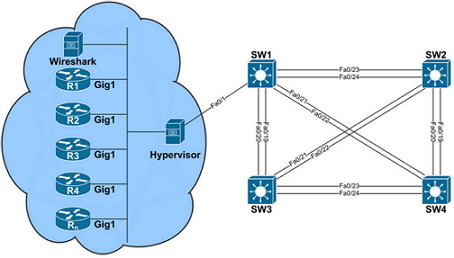 You can then look at conquering the switching topology with GNS3 with L2IOU. Again, it can be confusing for those who are not virtualization gurus, but it is another approach that some aspiring CCIEs will definitely explore. So that brings us to the novel idea of actually using real routers and switches! As surprising as this may sound, the cost to build this physical lab is not much more than a properly resourced virtual environment and you will not have to deal with all the associated virtual headaches. There really will be two levels from a physical lab perspective. The first being using all ISR G2 routers such as 1900, 2900 or 3900 series routers that will be running IOS 15.3T Universal with IP Base, Data and Security enabled. Then from a switch perspective you will be looking at 3560 or 3750 E or X series switches that will be running IOS 15.0SE Universal IP Services feature set. The biggest disadvantage of this setup is cost. At the current time it would cost about $18K to build the lab and that is just not a feasible solution. So maybe if you are reading this in 2016, it can be revisited as maybe the prices will be down around $6K or so to build the CCIE lab. Click here to see the lab kit! CertificationKits CCIE v5 Lab Kit. The next solution is to use all ISR G1 routers such as 1800, 2800, or 3800 routers that will be running the Advanced Enterprises Services 15.1T IOS. This will support 95%+ of the exam concepts and put you in the same ballpark as a beefed up virtual environment with the bonus of actually working on real equipment! So what we suggest here is to go with 20 of the 1841, 2801, or 2811 routers. From a switch perspective you will go with four of the 3560 or 3750 switches that are non-E or X units and they will be running the Cat 15.0SE Universal IP Services feature set IOS for the actual switching labs and then one extra to have all the routers to connect to. Since there are 20 physical routers and 5 switches, we do suggest two additional options. 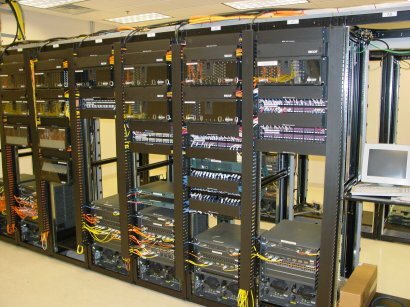 The first is our 28U Deluxe rack so you can rack them all and make it look pretty. The second is to select the option for the access server so you do not have to constantly move the console cable between devices. Now if you want to see what it took to become a CCIE, take a look at this link here!